Arm cream beauty treatment helps invigorate, firm and smooth the feel and look of skin. 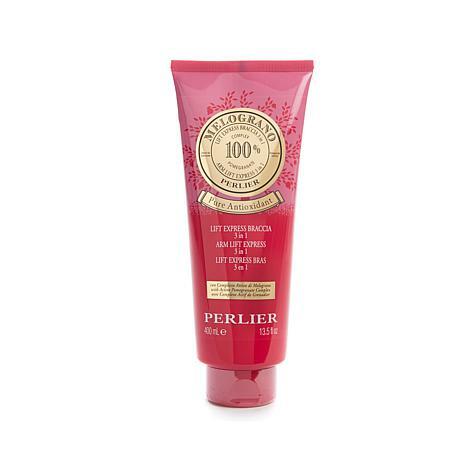 The core of the formula is Perlier's proprietary "Pomegranate-P complex," a complex that contains the most dynamic principles of pomegranate: water, pulp, seed oil and sterols, extracted from the skin of the pomegranate. A human patch test on 50 people showed no irritation. Apply in the morning and at night. 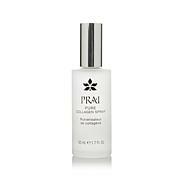 Massage in a circular, uplifting motion onto the most prone areas of "relaxed"-looking skin. Ingredients: AQUA (WATER), CAPRYLIC/CAPRIC TRIGLYCERIDE, GLYCERIN, ETHYLHEXYL COCOATE, POLYGLYCERYL-3 METHYLGLUCOSE DISTEARATE, HYDROGENATED VEGETABLE OIL, PENTAERYTHRITYL DISTEARATE, COCOS NUCIFERA OIL (COCOS NUCIFERA (COCONUT) OIL), CYCLOPENTASILOXANE, PUNICA GRANATUM FRUIT EXTRACT, CAFFEINE, LACTOBACILLUS/PUNICA GRANATUM FRUIT FERMENT EXTRACT, PUNICA GRANATUM SEED OIL, PUNICA GRANATUM STEROLS, POTASSIUM CETYL PHOSPHATE, OLEA EUROPAEA OIL UNSAPONIFIABLES (OLEA EUROPAEA (OLIVE) OIL UNSAPONIFIABLES), PRUNUS AMYGDALUS DULCIS SEED EXTRACT (PRUNUS AMYGDALUS DULCIS (SWEET ALMOND) SEED EXTRACT), BIOSACCHARIDE GUM-1, DIMETHICONOL, XANTHAN GUM, ACETYL DIPEPTIDE-1 CETYL ESTER, BUTYLENE GLYCOL, PARFUM FRAGRANCE), CARBOMER, SORBITAN LAURATE, PHENOXYETHANOL, ETHYLHEXYLGLYCERIN, SODIUM HYDROXIDE, TETRASODIUM EDTA, CITRIC ACID, LECITHIN, HYDROXYETHYLCELLULOSE, TOCOPHEROL, ASCORBYL PALMITATE, LIMONENE, HEXYL CINNAMAL, CITRAL. This is the absolute best for smoothing away the lines on your neck and decolletage area. I tried many products before and this is by far the one the gives me the best results. I heard Skip telling the host his mother uses it on that area and I'm ever so grateful I caught that comment. Thanks to Perlier and the Borghese family for an amazing product! My skin was looking dry and crepey. After one use I could see & feel a difference. The cream is smooth and luxurious. 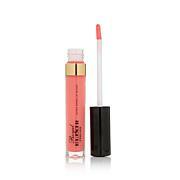 A generous amount of product in a large tube so easy to apply & for travel. I use as an all over body cream and it is a must! I use this product every day and am getting good results. I love the light scent but mostly what it does. Improves appearance of skin, absorbs easily. I don't use it up as fast as I should though. I had it on auto-order, but I still have a tube from the last auto-shipment. A little bit goes a long way! Love it... its the best cream/lotion ever.